So most of my traffic comes from a handful of posts, specifically my posts reviewing products from the brand Deciem. Unfortunately, in light of overwhelming evidence that the owner of the company is not someone I want to support, I’ve finally decided to stop patronizing the brand. 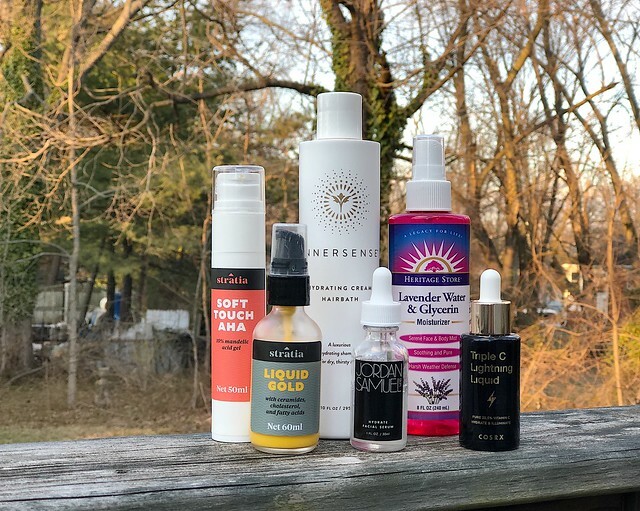 But, honestly, I don’t really have any current favorites from Deciem anymore anyway, so it’s not such a hardship, so rather than just adding to the rhetoric against the brand (better writers than I have written about it), I’m going to share some of the products I’ve been using that are either replacements or even upgrades to previously-reviewed Deciem products. The first post on Deciem I ever wrote was a review of their Hyaluronic Acid serum. A little while after that, I wrote a post called “Battle of the Deciem Brands” where I faced off The Ordinary’s Buffet serum with Hylamide’s SubQ Anti-Age serum, which are both ultimately hydrating serums with peptides added. I came out on the side of the Hylamide serum, but I haven’t actually used either of these in over a year. Since then, I’ve discovered one of my favorite new-to-me brands: Jordan Samuel Skin. Jordan is a joy to watch on YouTube, and an absolute doll to interact with on social media. He’s responsive, supportive, and just plain nice. AND he has a small-but-thoughtful line of products that are natural-led without neglecting science, and free of fragrance and essential oils. I’ve been using his Hydrate serum, which is a hydrating serum with peptides and a bit of stable vitamin C, for over three weeks now and I’m reasonably certain I can give it credit for how amazing my skin looks lately. Another product I reviewed positively from Deciem is their Hylamide Hydra-Density Mist, which is hydrating and soothing, but is ultimately a hydration step. Since then, I’ve stopped spending money on in-between steps meant to either hydrate or seal in hydration. So instead of buying expensive watery toners or mists, I go between steps with several sprays of Heritage Store Lavender Water and Glycerin. It has water and glycerin to grab hydration, and a light lavender scent. They also make a rose version. If you absolutely cannot handle scent of any kind, this isn’t for you, but my fragrance-sensitive skin loves it and it’s cheap at my local natural foods store. This isn’t a straight replacement, but that first Deciem review also included a review of The Ordinary’s Niacinamide serum. I’ve since stopped focusing much on niacinamide as a mainstay of my routine, but the 4% niacinamide in my favorite midweight moisturizer is plenty to keep my skin happy. As a bonus, the Liquid Gold also has ceramides and some lovely plant oils. And Alli is just so sweet a person. She also has a small but thoughtful line of products that are firmly science-led, and is highly responsive on Instagram. Another of my early reviews was the Hylamide C25 Booster vitamin C serum. I liked that it was easy to use, cosmetically elegant, and seemed to give my skin a nice glow while still being shelf-stable and free of worries about oxidation. Well, I’ve done some research and there’s not a whole lot of evidence that ethyl-ascorbic acid is as effective as l-ascorbic acid, so I started investigating L-AA serums. I settled on the COSRX collaboration with Charlotte Cho of Soko Glam. This serum is a 20.5% L-AA serum with black chokeberry to help prevent oxidation. I do keep mine in the fridge and check the color regularly, but after two to three months of use, I haven’t seen it turn more than a pale champagne color. And it feels like water on the face. It is acidic, so there is a slight sting if you apply it on broken skin (i.e., a spot that might have mysteriously popped while you were doing your routine), but other than that, it’s benign and just serves to keep my old hyperpigmentation fading and my skin bright. I’ve actually done a full review here. I’ve spoken in the past about my hair care routine and how some of my favorite products were the Hair is Fabric foaming conditioners. They’re basically an upgraded version of conditioning shampoo. Well, although I liked the way they made my hair feel, they all have unbearably strong scents, even after a supposed reformulation a while back. So I started experimenting with hair care again. And I landed on a winner: Innersense Beauty. I’ve started using their Hydrating Hair Bath during the week in a similar way to the HIF cleansing conditioners — as a moisturizing one-step cleanse in the shower, with a leave-in conditioner for extra nourishment. I also use their Hydrating Cream Conditioner as a deep conditioner once a week after a more clarifying shampoo, and I love their Sweet Spirit Leave-In Conditioner and Quiet Calm Curl Control Creme as leave-in treatments. The scents are all natural and the perfect balance of a pleasant shower experience without a lasting cloud of scent on my person. Also, they sell minis so you can try the products without a huge initial financial outlay! Just before the most recent stuff hit the most recent fan for Deciem, I was testing The Ordinary’s 10% Lactic Acid serum as my thrice weekly chemical exfoliant. It’s cheaper than my previous serum and a similar potency. When I decided I definitely needed to try to move away from Deciem, I brought out a bottle of Stratia Soft Touch AHA 10% mandelic acid gel that I had (probably unfairly) tested and abandoned around the time I was recovering from my miscarriage. As I love the Stratia brand and I wanted to give it a fair shake AND I didn’t want to buy a new product after developing uncomfortable feelings about my remaining half-bottle of The Ordinary LA, I decided to try it again. And I’m so glad I did. It does the same job of keeping clogs at bay on my chin, it’s a similar price point to The Ordinary (it’s 2/3 more product), and it’s in an airless pump instead of a fiddly dropper. If you’re looking for an inexpensive, gentle AHA, give it a try. NB: I was not paid to review any of the products mentioned here and purchased all of them at full price with my own money. See more about my policy around accepting products for review here. I’m so sorry to hear about your miscarriage.. Even though it must be difficult, I hope that you’ll recover and pull through stronger. Best wishes! Thank you. It’s been a few months and I’m doing okay, but I realized that I probably should revisit products that I thought didn’t work under the influence of hormones!